or Malaysia. They made their way to the eastern Mediterranean with the Arabs, and to the western Mediterranean, with returning Crusaders, and eventually to the West Indies, when Columbus introduced citrus fruits there on his second voyage. These limes, used in most of the world, are what we call Key Limes. while they are still green in color (they turn yellow when fully ripe, and might be confused with lemons). Key limes which predominate in the rest of the world, are smaller, yellower in color, seedy, sourer, and grow on thorny trees which are sensitive to cold weather. As we have done with tomatoes, we have sacrificed flavor for convenience and appearance. Key limes were grown commercially in the southern Florida and the Florida keys, until the 1926 hurricane wiped out the citrus groves. The growers replaced the Key Lime trees with Persian Lime trees because they are easier to grow, easier to pick because they have no thorns, and due to the much thicker skin, are easier and more economical to ship. There are still many Key Lime trees throughout the Florida Keys in backyards, however commercial production is only on a very small scale. Though they do seem to be making a slight comeback as a Florida crop in recent years. Key limes are small, somewhat larger than a walnut, oval in shape with a thin yellowish rind which are prone to splotchy brown spots. They are aromatic and very juicy, with a stronger and more complex acidic flavor than Persian limes. The evergreen trees are 7 to 8 feet tall, shrubby, crooked and thorny, with shiny green leaves. Both Persian and Key Limes have a higher sugar and citric acid content than lemons, and Key limes are more acidic than Persian. Key limes (like Persian limes) are more susceptible to frost than other citrus fruits. The peak season is during the summer, June through August, but they are available year-round from Mexico and Central America. Unless you live in the Florida Keys or are otherwise a Key Lime pie aficionado, in which case only limes grown in the Keys are acceptable as 'Key Limes'. Most (more than 90%) of the Key Limes increasingly found in supermarkets are grown in Mexico and Central America; they are also grown in Texas and California, where they are known as Mexican limes. Juice content is high, well over 40%. Skin should be light yellow and fine grained, like leather. Avoid any signs of decay, mold or blotchy, brown spots. Don't buy if skin is turning hard or shriveled. Store at 40º - 45º F. for two weeks maximum. Frozen juice keeps for two to three months. Bottled juice is available, but very inferior (especially for Key Lime Pie!). As a Key West resident, I must say first and foremost, Key Lime Pie. They are also delicious in beverages, sorbets, and jams. They are excellent in marinades for fish (seviche) or meats and chicken, and used in fish and meat stews. 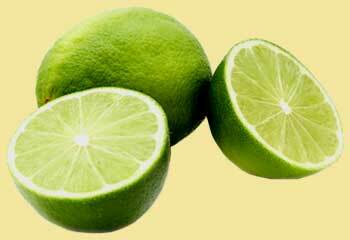 Limes, including the Key Lime, actually contain less vitamin C than lemons. There is also a 'kaffir' or Indonesian lime tree (Citrus hystrix), whose leaves are used in Thai, Malaysian and Indonesian cuisine, and are sometimes available in this country. There are also very sweet limes, called appropriately 'sweet limes', which are apparently used mostly in North African and South American cuisines. The unrelated Genip (related to litchis) is also called Spanish lime. Oh, one more. The linden tree (a basswood) is also called lime tree, especially in England.